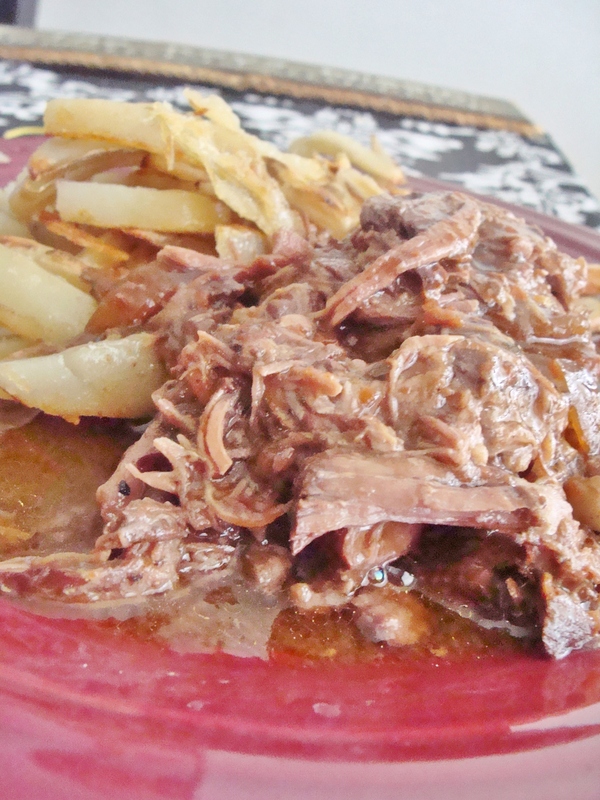 slow cooker shredded beef with french fries. I’m pretty excited to share this recipe for my shredded beef, which is my Mom’s. Tender, juicy beef, in a delicious broth. Serve it up over simple oven-baked french fries and you’ve got pure bliss. I also credit this meal with preparing me and my boyfriend for our recent half marathon — it was an ideal protein and carb load two nights before the race. Now, I realize photos of shredded beef aren’t the most appetizing (unless you are me and get really excited about meat). But I promise this is a no-fail recipe & you will love it. Using a fork, make a dozen or so tiny puncture holes on both sides of the beef roast. This will help seal in the marinade. Place your roast in a glass dish. In a large bowl, blend your beef bouillon granules, Ketchup, Worcestershire sauce, minced garlic, apple cider vinegar, and black pepper. Pour this mixture over your beef. Flip the roast over, and make sure both sides are coated with the marinade. Place the roast in your slow cooker. Then, pour the can of French Onion soup on top. Slow cook your beef for 8 hours on low. When the beef is done, remove the meat from the slow cooker and place in serving dish. Pour the remaining broth out of the slow cooker into a gravy boat or bowl. Peel your taters. Rinse in cold water, then pat dry with a towel. Using a very sharp knife, slice your potatoes into 1-inch strips. Place the strips in the freezer bag. Then, pour 1 tablespoon (or generous glug) of olive oil into the bag. Drop in your minced garlic cloves. Now, the fun part: Seal your bag, then toss it around in your hands to coat all the potatoes with olive oil and garlic. Pro tip: If you do this the night before, you can keep the bag of potatoes in your fridge until you are ready to bake them. When ready to bake your fries, first spray a baking sheet with Pam or non-stick spray. Then, dump your bag of potato strips on the sheet. Season liberally with pepper and sea salt. Bake for 20 minutes, then remove sheet from oven and flip the fries with a spatula. Bake for another 20 minutes. If you’d like the fries to be extra crispy, broil them at a low heat for 10 minutes, or until you see the fries start to brown. We poured extra beef broth over the fries. Ohsogood. § One Response to slow cooker shredded beef with french fries. 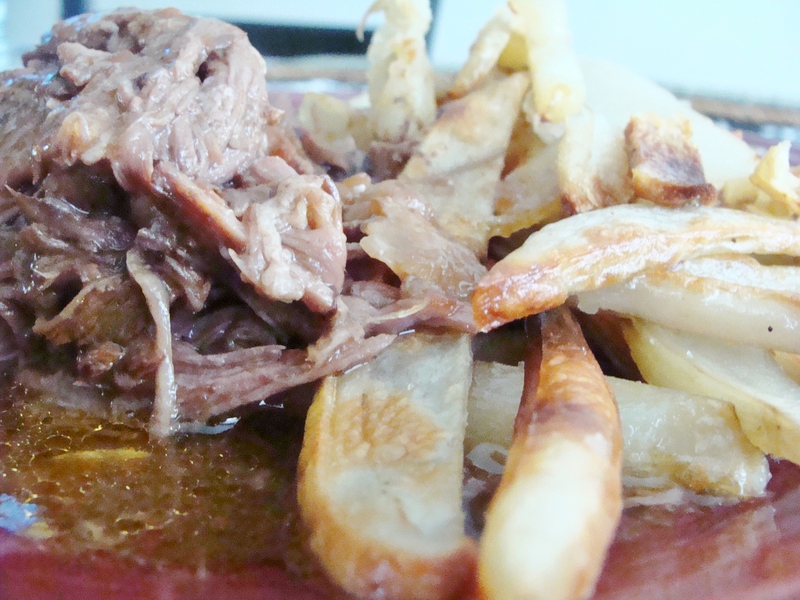 You are currently reading slow cooker shredded beef with french fries. at The Cheesy Kitchen.